Originally published on the Hatnote blog. Moreso than any other major site, Wikipedia is centered around knowledge, always growing, and brimming with information. It's important to remember that the insight of our favorite community-run encyclopedia often follows the focus of its massive readership. Here at Hatnote, we've often wondered, what great new topics is the community learning about now? To shed more light on Wikipedia's reading habits, we're pleased to announce the newest addition to the Hatnote family: The Hatnote Top 100, available at top.hatnote.com. Because we can't pass up a good headwear-based pun. Updated daily, the Top 100 is a chart of the most-visited articles on Wikipedia. Unlike the edit-oriented Listen to Wikipedia and Weeklypedia, Top 100 focuses on the biggest group of Wikipedia users: the readers. Nearly 20 billion times per month, around 500 million people read articles in over 200 languages. Top 100's daily statistics offer a window into where Wikipedia readers are focusing their attention. It also makes for a great way to discover great chapters of Wikipedia one wouldn't normally read or edit. 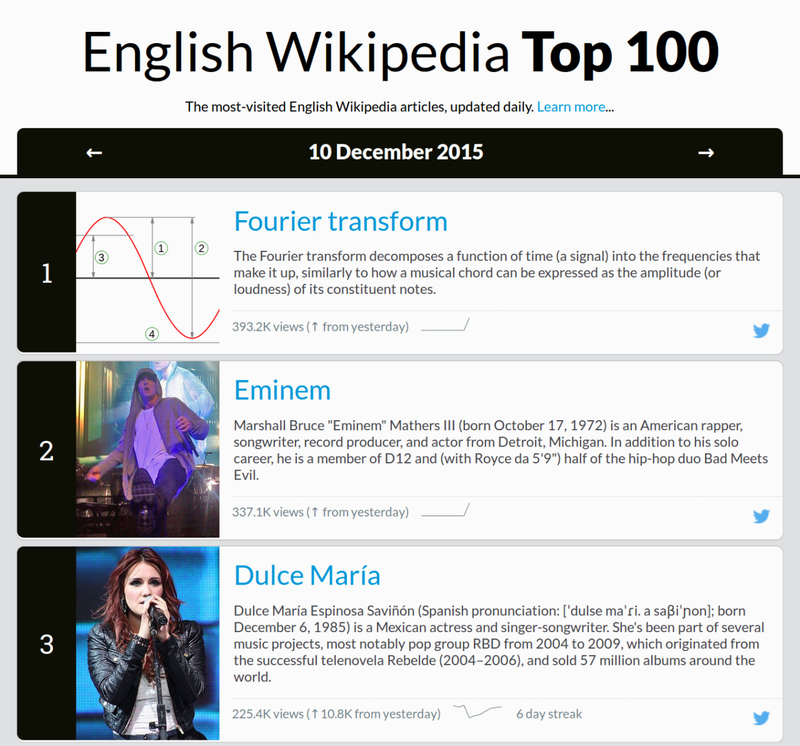 Clear rankings, day-to-day differences, social media integration, permalinks, and other familiar simple-but-critical features were designed to make popular Wikipedia articles as relatable as albums on a pop music chart. In practice, popular news stories and celebrities definitely make the Top 100, but it is satisfying to see interesting corners of history and other educational topic sharing, if not dominating, the spotlight. In addition to a clear and readable report, Top 100 is also a machine-readable archive, with reports dating back to November 2015, including JSON versions of the metrics, as well as RSS feeds for all supported languages and projects. It's all available in over a dozen languages (and we take requests for more). The data comes from a variety of sources, most direct from Wikimedia, including a new pageview statistics API endpoint that we've been proud to pilot and continue to use. And yes, as with all our projects the code is open-source, too. And there are other visualizations on seealso.org as well. But for those who like to keep it simple, hit up the Hatnote Top 100, subscribe to a feed, and/or follow us on Twitter. See you there!